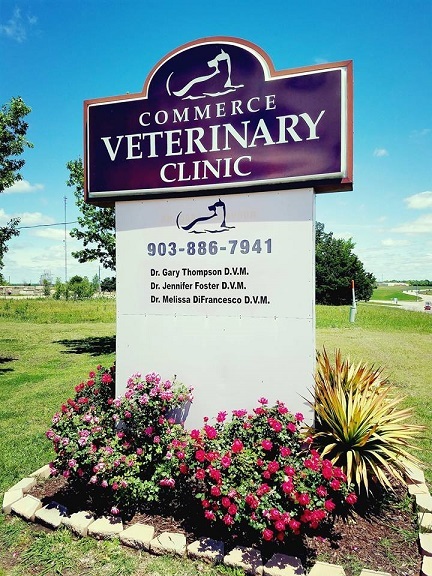 If you live in Commerce, Texas or the surrounding area and need a trusted veterinarian to care for your pets – look no further. 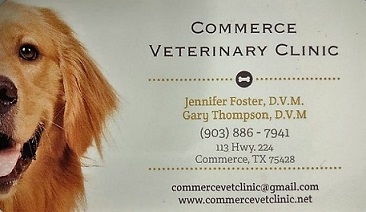 The doctors at Commerce Vet Clinic are all licensed Texas veterinarians, treating all types of pets. Your pets’ health and well-being are very important to us, and we take every possible measure to give your animals the care they deserve. Beyond first-rate pet care, we make our clinic comfortable, kid-friendly, and calm, so your pet can relax in the waiting room. We are happy to offer a number of resources that enable you to learn about how to take better care of your pets. Please feel free to browse our site, particularly the informational articles. The best veterinary care for animals is ongoing nutrition and problem prevention, so becoming knowledgeable about preventative pet care is essential to the ongoing success of your animal’s health. If you have any questions, please call 903-886-7941 or email us and we'll promptly get back to you. At Commerce Veterinary Clinic, we treat your pets like the valued family members they are. "Dr. Thompson and his staff have taken care of my fur babies since we moved here in 2000. They are like family. In one word COMPASSION describes their work ethic." "Dr Foster has been awesome helping with our furbabies. Saw Dr Thompson once and have high regard for him as well! Dr Foster (whom we see most) is very kind and she actually listens to you, explains everything and answers any questions. If she can't do something, she doesn't act like she can--she is honest and will refer you so you get the best possible care (she is currently working with a specialist for our girl). This is so important to me because it shows she cares abut my babies' well-being. We appreciate everyone up there, staff and all! So friendly!"